In anticipation of National Chocolate Day–drink up! I love chocolate, and I would be unlikely ever to turn down good hot chocolate or cocoa. I’m glad fall is finally here with relief from the hot humid, muggy weather; however, today is the ninth day of measurable rain in a row, and what with hurricane Joaquin making its way north along the coast, we’ve got several more days of gray, rainy weather coming–maybe a record-breaking string of rainy days. Well, after a brief lull this afternoon, the rain is back. As I listen to the rain on the metal roof, what better to do on chilly, grey, soggy, damp, rainy days than make hot chocolate or hot cocoa? A real comfort beverage even if you don’t enhance it with spirits. So start with a good cup of hot chocolate or hot cocoa. . . .
First, let’s be clear about the definitions of hot cocoa, and hot chocolate. These terms are often used interchangeably by Americans and use the terms to apply to some really atrocious mixes. If you’re really “into” this beverage there’s a whole lingo you should know. however there is a difference (Amano chocolate page). In a nut shell: hot cocoa is made with cocoa powder, milk and/or water. It’s a thinner beverage. Hot chocolate (also called drinking, or sipping, chocolate) is made with chocolate (often shaved or ground to melt faster) which, because of the natural fat in chocolate makes it a richer beverage. Place chocolate (cut if in large block) into microwave-save container. The container needs to be large enough to allow you to whisk the warmed mixture vigorously. Add honey and pour half-and-half over. Microwave for about 2 minutes–until milk/half-and-half is steaming, but not boiling. Add pinch of salt, and whisk vigorously until the chocolate is emulsified and mixture is slightly thickened. Taste and add more honey if needed, and vanilla if desired. Pour into a carefully warmed mug, sit back, and enjoy. Don’t serve this in a thin, fancy cup–even though it’s rather decadent. I use a mug warmed thoroughly with almost-boiling water so that this creamy, sensuous beverage will stay warm while i sip it slowly. Don’t bother with whipped cream–it’s rich enough without. Now you have a very dark creamy cup of chocolate. Good as is, but it’s fun to add some different flavors. With all this cold rainy weather, I’ve been experimenting with additions. 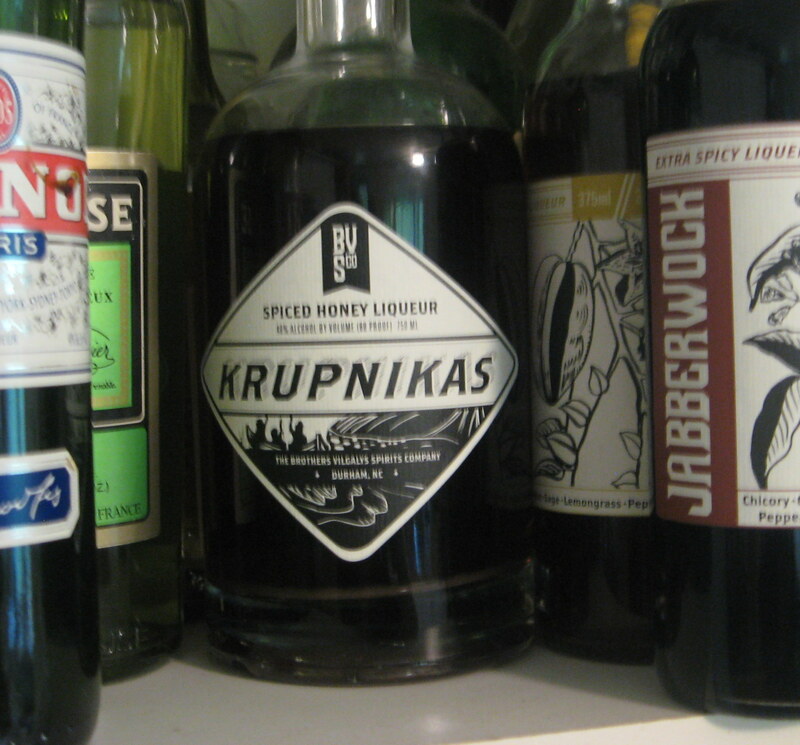 One of my favorite inspirations was to add a splash of Krupnikas–a spiced honey liqueur. Awesome! Another liqueur from the Vilgalys Brothers Jabberwock–a very spicy–with coffee, chicory, lemongrass, eucalyptus, manzano and chipotle peppers–makes a spicy cup of hot chocolate–probably my favorite so far. A splash of Chambord would not be amiss either! if you want fruit rather than spice.